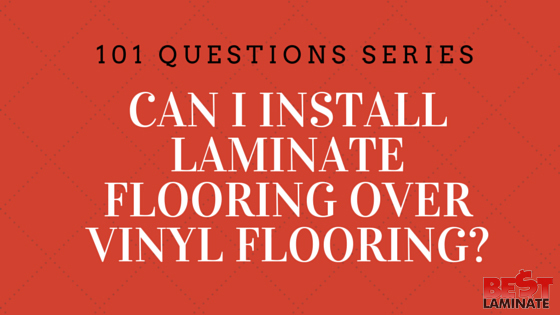 Home >> 101 Questions Series >> Can I install laminate flooring over vinyl flooring? Many homeowners ask whether or not they can install laminate flooring over vinyl flooring. 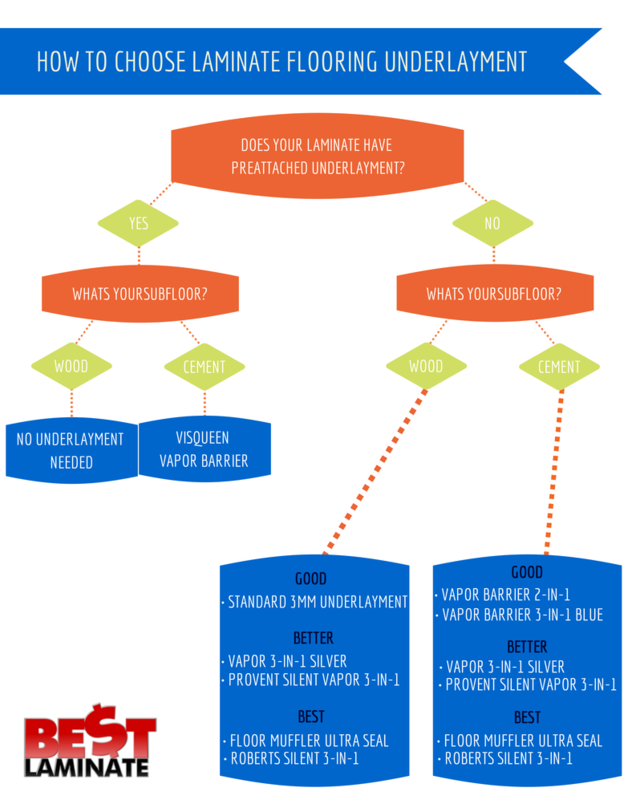 The short answer is yes, you can install laminate flooring over vinyl flooring. However, there are special things to consider. When using a glue-down vinyl as a subfloor, it must be level and in good condition. If there is any peeling, gaps or damage, you should not use this as a subfloor. An underlayment will still be required over top of a glue down vinyl subfloor. The subfloor underneath the vinyl should be in good condition and level as well before tying to install laminate flooring on top of it. If you decide to install laminate flooring over vinyl flooring, remember to first clear the vinyl of any debris and obstacles. It is important to have the floor as flat and well prepared as possible to allow the laminate to be smooth and seamless when installed. If you have any questions, please write them in the comments below or call us at 1-800-520-0961 and our sales representatives can help you with your purchase! Hi Tammy, thanks for reaching out. Laminate flooring is moisture resistant, but not waterproof. Even if you install over glue down vinyl, the laminate flooring will still not be waterproof and in the event of a spill or flood, the flooring would be damaged. What is your budget? We have some very budget friendly vinyl plank options that we would definitely recommend, and vinyl will be 100% waterproof. Give us a call, we would be happy to send you some free samples and work with you on best pricing. Hope this helps! I have glue down vinyl sheet flooring and will have once I remove carpet concrete as my subfloors. I would like to eliminate removal of the vinyl however I’m concerned about the 2 translation points ( sheet vinyl to concrete) can I feather this out on the concrete side so it won’t be noticeable and then continue to lay vapor barrier over the concrete part overlapping the sheet vinyl ? Then padding over all the floors or would this not work and I have to remove the vinyl? I have a vinyl that is not attached or glued to the sub flooring material. When you lift it up, there is an old hard plastic sheet (1970s stuff) of previous flooring,that is glued to plywood, glued to cement sub flooring. The vinly sheet lays flat on top of that stuff. Could we just take the vinyl off and leave whats under there, then, lay in laminate on top, as long as its flush? What substance would we use between the old plastic sheet and the new laminate to make it work? Hi Sharon, thank you for reaching out! Based on what you described to us, you can go ahead and install laminate flooring over the old vinyl that is glued to the subfloor. First, uninstall the existing vinyl and clean off the subfloor, making sure it is flat, smooth and dry. The old vinyl will act as a moisture barrier, and you will need to install underlayment to allow your laminate floor to float. Below is a link to an underlayment we would recommend. You can go ahead and install laminate flooring of your choice on top of the underlayment. Please let us know if we can answer any other questions or help you find the perfect laminate for your projects. Best of luck! 1- In general, does well laid, level, clean and old vinyl flooring provide a moisture barrier? 2- Why cannot laminate be installed over vinyl tiles that have been glued? 3- In the latter case, instead of pulling up the vinyl tiles (a major, messy piece of work) can I put plastic, then foam underlayment and then laminate? 4- Can I install rigid foam insulation over the vinyl floor, then laminate on top, or do I still need underlayment on top of the insulation? Hi Eduardo! Thanks for the question. 1. Yes, your vinyl flooring will provide a moisture barrier, however, you will need to installed a foam underlayment on top. 2. Laminate can be installed over glue-down vinyl. There are some things to keep in mind with this – all planks need to be firmly glued (no peeling, gaps, etc.) and the floor needs to be level. If there are some planks that do not meet this, or there is an un-level subfloor, you must fix it or un-install the planks. 3. I would recommend using an underlayment that has thermal properties, such as Floor Muffler or Kronoswiss ProVent, which includes a moisture barrier and insulation. 4. You should not install foam insulation over your subfloor. To install the laminate, you must have a solid base (subfloor) to put the laminate on top of. A foam insulation would provide an unstable, cushioned surface which can cause stress to the floating floor joints. I hope this helps! Please let us know if you have any additional questions.